If the estate and farm of San Antoni had a voice it could recall so much history which has been seen passing from its terrace. With the original building dating back to the 13th century to the more modern Palladian style facade of the 18th Century the amazing unfolding events of the last 700 years can only be understood by a visit. With the expertise of the Asociación Menorca Britannia this can now be a reality. Guided visits can be made on selected days and times. Hear of the events which have shaped the chequered history of Menorca, of the famous people who have graced it’s rooms and see the historic collection of artefacts within it’s rooms. 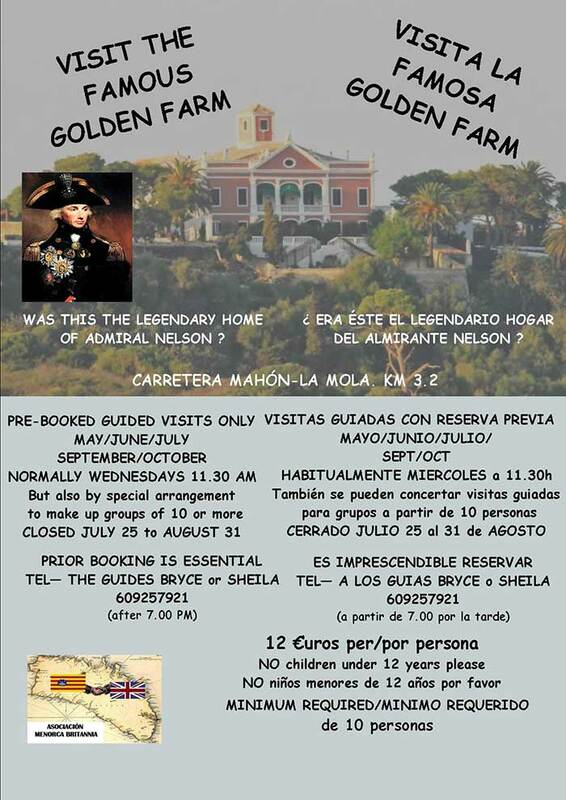 What is the reason for the name San Antoni and why did the British in the 18th century refer to the estate as The Golden Farm. Visit and hear all the answers but only through the Asociación Menorca Britannia and their English speaking guide.